Malad Valley, in Oneida County, is located in the Southeastern part of Idaho. The town was left with the name Malad, because of the original naming of the Malad River which meant sickly waters. In 1855 President Brigham Young gave this description of Southern Idaho. “Malad Valley, north of the Bear River, has been considered a pretty desolate, cold, hard, sterile valley. As we passed through it on our way north, we considered it tolerably good grazing country, and that people could possibly live there. But after we had traveled over the basin rim into Bannock County, down through the little Bannock Valley, over to Salmon River and wended our way down that stream through the swamps and willows and climbed over the points of the bluffs to keep from being mired, and returned again to Malad Valley, it looked to us like the most beautiful valley that any person had ever saw. Before this experience we thought nobody could live there, and I expect that if we had gone a few hundred miles north it would have looked still better.” In 1856, a colony of 15 families led by Ezra Barnard came to Malad Valley and established Fort Stuart, called Malad City in 1857. The first man to settle permanently in Malad Valley was A.W. Vanderwood, in 1863. Henry Peck, realizing the business prospects of Malad Valley, built Malad’s first hotel in 1871. Travel was increasing each year with the rising importance of Malad Valley as a center of the County. The Idaho Enterprise published its first issue on June 6, 1879, with J.A. Straight as the publisher. The paper is one of the oldest in Idaho, and is still published weekly. The first store was built by A.W. Vanderwood. The upper room was a courtroom and part of it was a telegraph office, the first telegraph office in Southeastern Idaho. In 1882 there were two hotels, six stores supplying dry goods, groceries, hardware, furniture, harnesses, shoes, and two blacksmith shops. The J.N.Ireland and Co. Bank was incorporated Dec. 1, 1892, and is today an attractive and vital part of Malad Valley. The railroad came to Malad in 1906. During the next 15 years after the railroad, the population doubled. Salt Lake City was then only four hours from Malad by rail. 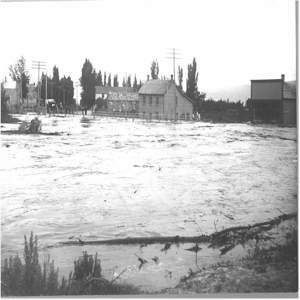 Malad experienced a flood on June 19, 1910, when a earthen dam, North East of Malad, broke.